Apparently the word on the street around here is that my coop is a haven for wasps. Last count I had six different groups of wasps in the chicken coop, busy building away. I noticed the first nest about a month ago, right above the entrance to the chicken run. We leave each other alone, so I haven’t done anything about it. 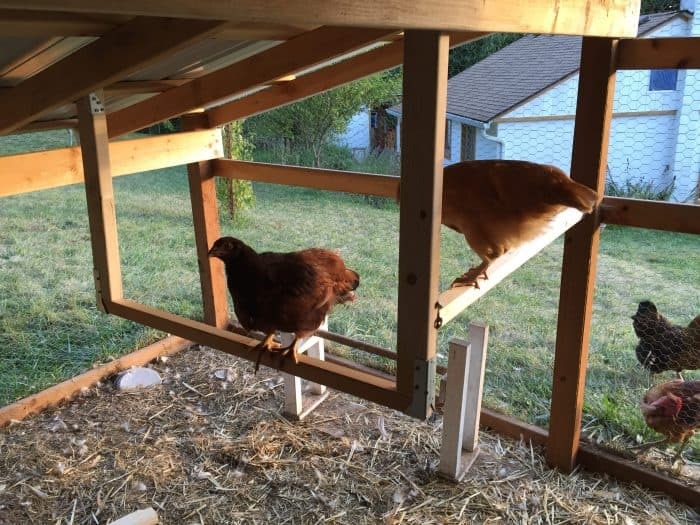 But last week, while I was building the chicks (not really chicks anymore, but they’re still my youngest babies) a roosting pole inside the chicken run, I saw three more nests. One nest hung precariously close to where my head was as I drilled a screw into the beam they were hanging from. Eeeks. I started looking around after that, hoping to avoid a head to nest collision in the future and found SIX nests all total. All inside the chicken run. I guess word gets around fast in the wasp world. Come on over to this great coop! You’ll love it. WHAT?!?! I don’t think so! Honestly, the wasps don’t really bug me that much (no pun intended). They stay out of my way for the most part and I generally ignore them. Bonus points are that my chickens love to eat them (there’s no accounting for taste). And no, it’s not dangerous for chickens to eat wasps. BUGS are part of their diet. 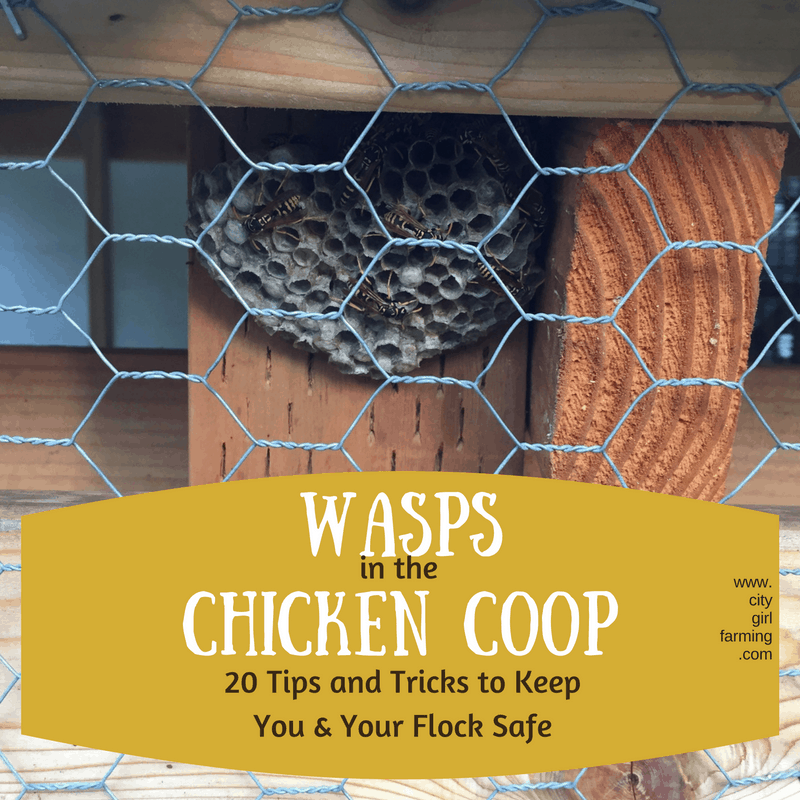 It’s all fine and well that chickens like to eat wasps, but what if you don’t WANT wasps in your chicken coop? How do you get rid of them without danger to your flock? 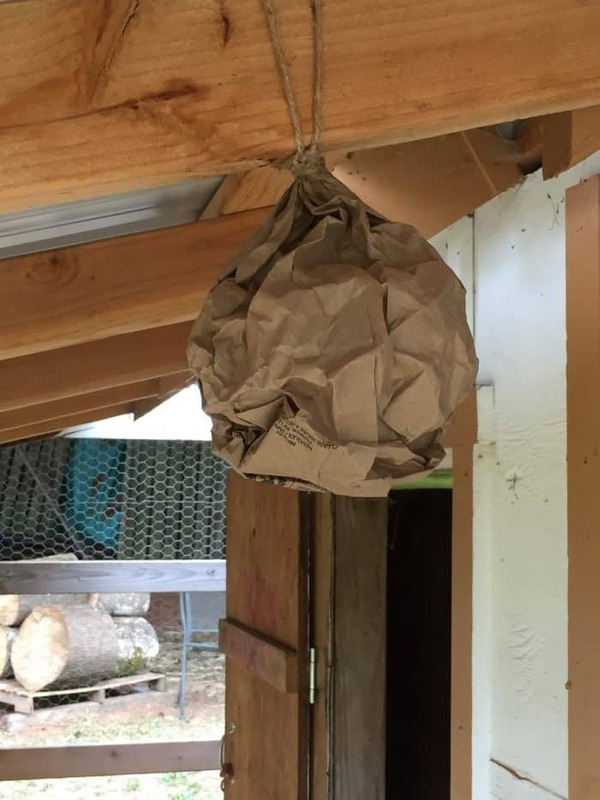 If you spray a bunch of toxic wasp killer into your coop, the wasps drop down in the run/coop and guess who is going to think you delivered them a tasty snack? 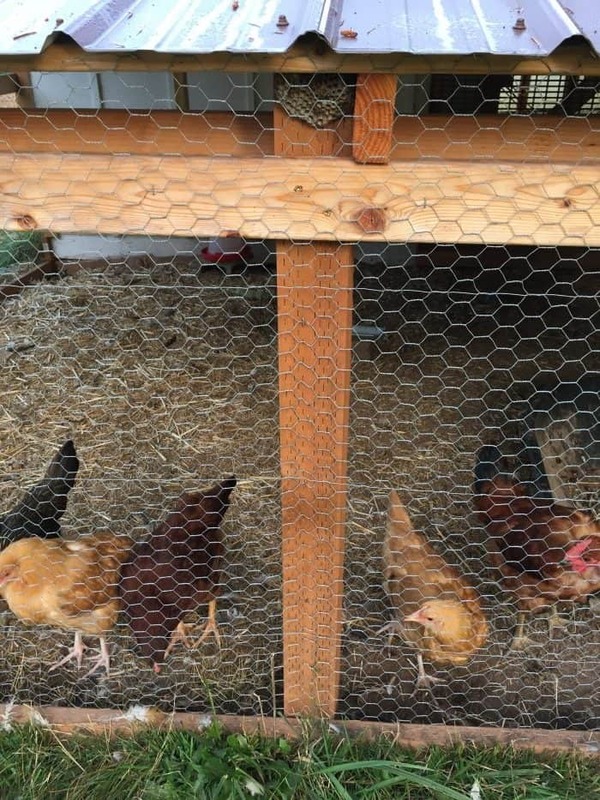 You really don’t want your hens to eat poisoned wasps. Wasp killers are way more harmful to your chickens (and to you and the rest of the world) than wasps are. I was reading directions online for some of those toxic products the other day and one of them said to DISCARD the clothing you wore while you were spraying the toxic solution onto the wasps. DISCARD? Really? I’m thinking if I have to throw away clothing that I was wearing while I was spraying something in the general direction AWAY from me, in an outdoor space with lots of ventilation, that is NOT something I want on my property. Wasps or no wasps. In my case, the wasps in question are Paper wasps, which are helpful creatures (they eat other annoying bugs as well as aid in pollination). They are also less aggressive. I went out one night and knocked three of the nests down. I might get rid of one more (it’s a bit more tricky of an angle), but the other two are out of the way and I don’t care if they stay. One: Deal with the issue at night. While wasps will notice you, they are slower at night and less aggressive. Wear long sleeves and something over your head (like a hoodie or bandanna). Four: Pick a chilly night. They move a LOT slower in the cold. Five: Make sure you have a clear path for retreat. This is a hit and run technique, so you want to make sure your escape route is clear. Six: Make sure to GET the wasp. If you’re spraying/coating them with something, it works better if the nest isn’t concealed. Coating the actual insect is the goal and it’s hard to coat them if you can’t see them. Seven: Do any of this at your own risk. Enough said about that one. Eight: If it’s a big nest, consult a professional. Or if it’s making you feel too weak in the knees. While wasp stings aren’t lethal (unless you’re allergic), they still hurt. This is what I did. With a big stick. Liberally coat the wasps with cooking spray. It will suffocate them and kill them. With this method, liberal amounts of soap and hot water work best. And you can use soapy water in a few different ways. One is to dump it onto the nest (or rather throw it, as it’s most likely above you). Another is to put it in a spray bottle or a high powered squirt gun and spray it on them. The third method is to place the hot soapy water in a bucket with a piece of raw meat hanging above it. The wasps will eat the meat, become lethargic, and fall into the soapy water to drown. Some people swear by Frontline Tick and Flea spray (the kind you use for dogs and cats) or 91% Rubbing alcohol (which evaporates quickly). These are less toxic than wasp spray but more toxic than the above solutions. You would use them in the same away as above. Once you get rid of those wasps, how do you keep them from coming back? One piece of good news is that wasps rarely build a nest on an old spot. Yay for that. Nineteen-Twenty: Stay on top of it. Keep wasp traps up all the time to avoid the problem before they start building their nests. You can also periodically spray the above essential oil mixture on surfaces (or into cracks) where you see wasps coming and going to discourage them from hanging around. Other folks have said if you rub soap (or furniture polish) on the underside of your rafters, etc. where wasps like to build nests, they won’t build a nest there. Or, I’ve also heard that if you paint the underside of your rafters and beams light blue, they also won’t build nests there (supposedly because they think the light blue is the sky). These could be worth a try. Let me know how they work for you if you try one. In the end, no matter what you decide to do or not to do with the wasps in your chicken coop, use caution and try to avoid toxins. And, if they’re a ‘nice’ kind of wasp (like the Paper wasp), consider leaving them completely alone. Disclaimer: Links on this website are often affiliate links. This means if you click on them, and make a purchase, I receive a tiny bit of money to help me run this site. This does NOT cost you any extra.